What the Pentagon really spends. Part 1 of a <em>Mother Jones</em> special report. This is Part I of a Mother Jones special report on the defense budget. Click the links for Part II, III, IV and V.
Unfortunately, Washington pols have been saying similar things ever since the Defense Department was created. And over the years a nearly constant procession of blue-ribbon commissions and special taskforces and congressional crusades has attempted to tackle the problem and failed. (See, for example, the Fitzhugh Commission, the Grace Commission, the Nunn-McCurdy Amendment, the Packard Commission, the Carlucci Initiatives, the Defense Management Review, the National Performance Review, the Bottom-Up Review, the Federal Acquisition Streamlining Act, the Federal Acquisition Improvement Act, the Acquisition Streamlining Task Force, Total System Performance Responsibility, and the spiral development and capabilities-based acquisition initiatives.) Cost overruns for major weapons programs now total $296 billion. We could never afford this rampant squandering of public money, but now, with the economy in crisis, the need to end the Pentagon’s profligacy has become even more urgent. But will Obama’s attempt at reform be any different from all those that have gone before? Over the next few weeks, Mother Jones will attempt to find out. We’ll dig into the gory details of Pentagon spending and watch out for porky shenanigans as Gates’ budget makes its way through Congress. We’ll take you behind the scenes to meet the key players who will determine whether the Pentagon cleans up its act or continues on with business as usual. Above all, we promise to do our best to make it interesting. You can read our reports here; if you have tips or questions that you want us to chase up, send them to rmorris@motherjones.com. This year Obama asked Congress for $534 billion to fund the Department of Defense. That’s a lot of dough. 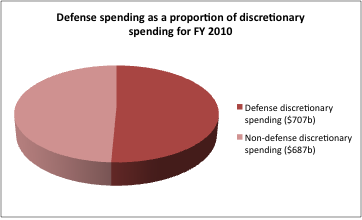 But the real amount that the US spends on defense is actually much higher. 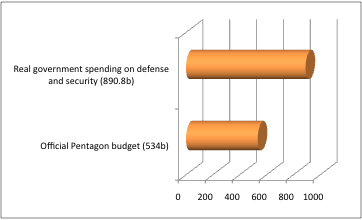 The Office of Management and Budget calculates a total for defense spending throughout different parts of the government (it includes money allocated to the Pentagon, nuclear weapons activities at the Department of Energy and some security spending in the State Department and FBI). In the 2010 budget, that figure was $707 billion, more than half of the government’s discretionary spending for the year. (Discretionary spending is the money that’s appropriated every year by Congress, rather than entitlement programs like Medicare for which funding is mandatory). Will Congress Torpedo Defense Reform?